Zoo With Roy: WARNING: BEWARE OF SAINTS FANS TONIGHT!!! 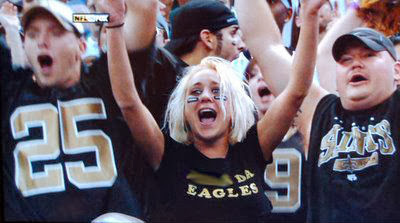 Nola.com writer Jeff Duncan wrote this postseason's version of the same hackneyed "Oh those Philly fans!" column, adding to the standard Santa/Michael Irvin/booing fare anecdotes like "the time I saw an old lady give the middle finger while flipping bratwurst" (note: that woman is a HERO). Now he's onto the predictable Twitter trolling. Wow. Just got to Philly after daylong sojourn to discover my inbox & timeline filled with invective. Who knew Philly fans were so sensitive? Wow. That's sad. I don't even fault the guy, this is low-hanging fruit. Though if you wanted to find fault, do so in that he was so overzealous that his story was factually incorrect and had to be revised by his editors. But I digress. THEY GET DRUNK, CHARGE THE FIELD, AND FIGHT COPS!!!! THEY SHOOT YOU IF YOU DON'T ROOT FOR THEIR TEAM!!!! THEY WEAR SHIRTS WITH VULGAR PROFANITIES ON THEM IN PUBLIC (AROUND CHILDREN)!!!! This is pretty dangerous and shameful stuff. Oh and also I'd like to warn the Eagles players to be careful, too, since the Saints head coach and organization have been proven to condone and incentivize needless violence if it led to (again, deliberately) injuring opposing players. 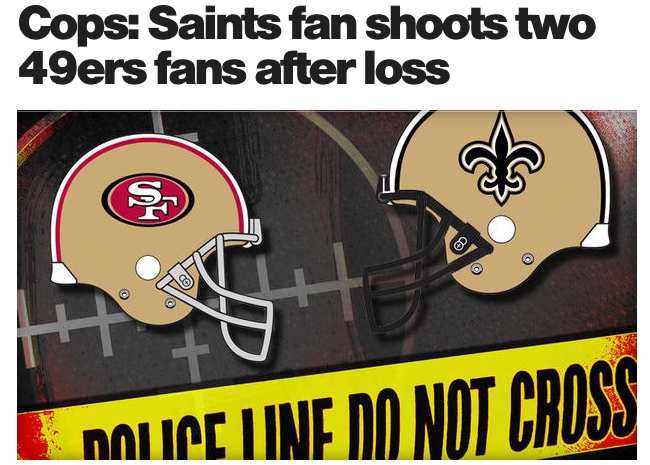 Also, heard on Philly sports radio yesterday, apparently Undercover Cops will be out dressed as Saints fans, in order to catch any would-be hecklers before things get out of hand.